As October draws to a close, we are well and truly heading for the depths of winter. The mornings are darker, it seems to be night time at 4pm and it’s definitely harder to crawl out of bed. Obviously winter brings with it some great celebrations too – yes, the advent calendars and Christmas chocolates are already on the shelves! There’s also Bonfire Night – on November 5th, many of us will be donning our woolly hats and heading out for some firework festivities. However, this season can also bring with it fire stories of a much more unpleasant nature. As many people switch on electric heaters, electric blankets, light up candles or stoke up their real fires, the risk of household fires is increased. A fire in your home can be a devastating experience, not only financially – but also emotionally. On Nov 5th, make sure all garden bonfires and firework displays are at a safe distance from your home. 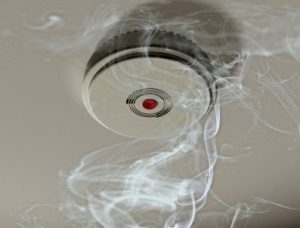 Make sure you have working fire alarms throughout your home and that these alarms are checked regularly (every week). You may also want to consider a sprinkler system in the property. Never leave the oven or grill unattended when you are cooking. Make sure you have adequate home insurance. Don’t underestimate the value of all your possessions collectively– in the event of a fire, unfortunately you could risk losing everything. Keep electric heaters away from furnishings and other objects. Do not leave them unattended. Old or poorly wired appliances could be a fire risk. Keep an eye on plugs and cabling to make sure they’re in good condition. Don’t overload plug sockets as this can cause over-heating. Keep candles in a proper candle holder so they don’t tip over. Keep at least 1m between the candle and any surface above it. Make sure any naked flame is away from curtains, fabrics, paper and the reach of children and pets. Extinguish the flame fully when leaving the room. Do a final check of your home before going to bed to spot any potential fire hazards. It obviously takes much longer to become aware of a problem if you’re fast asleep.